Solutions > Transportation > Transportation Solutions > Traffic Monitoring System Communication for Nevada D.O.T. The Nevada Department of Transportation (DOT) needed to expand their traffic monitoring system along Interstate 80, about 250 miles northeast of Reno. During this expansion project, the Nevada DOT chose Comtrol’s RocketLinx ES8510-XT switch to enable data transmission from their traffic cameras to server room monitoring stations, eventually showing up on live feeds at the DOT monitoring station. 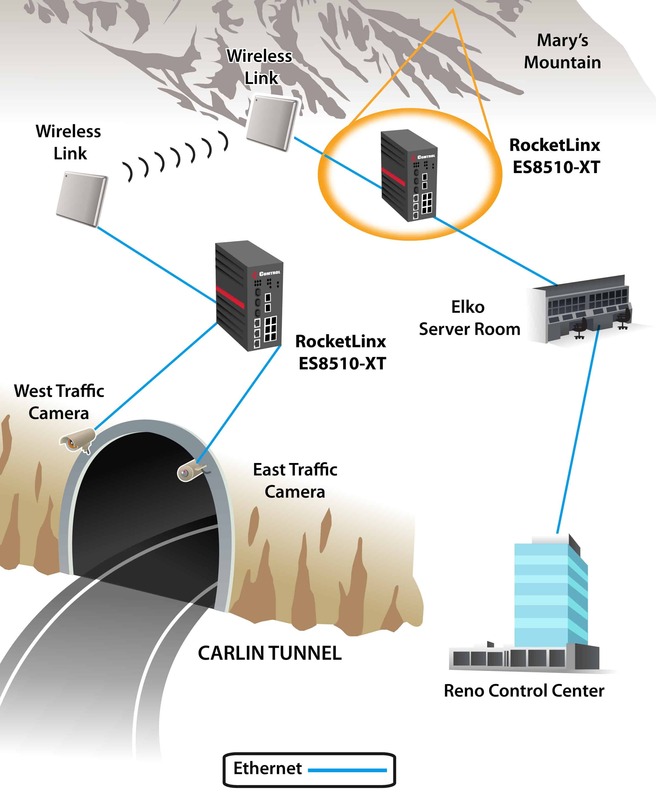 One of the monitoring systems involved installing two traffic cameras to monitor the traffic flow going both east and west through the Carlin Tunnel, just west of Elko, NV. Both cameras are connected to one RocketLinx ES8510-XT industrial Ethernet switch, which directs information wirelessly through a point-to-point wireless link to another RocketLinx ES8510-XT switch installed on Mary’s Mountain. The data is then routed down to Elko’s server room. Additional switch-camera installations of similar configurations near Elko are also routed to the server room, which sends all of the information to the DOT control center in Reno. The Nevada DOT decided to implement Comtrol’s switches into their system as a cost-effective, easily-configurable solution for their needs. The RocketLinx ES8510-XT was chosen over the competition for the addition of an extra fiber port as well as for its maneuverability within the DOT’s system structures. The switch is also NEMA TS2 compliant, allowing for reliable operation in extreme temperatures ranging from -40° to +74°C. The RocketLinx ES8510-XT is housed in a rugged aluminum enclosure that features an excellent heat dispersing mechanical design. The embedded software supports full Layer 2 management features, multi-form ring redundancy, network control, monitoring, security and notification. The RocketLinx ES8510-XT also provides a built-in watchdog timer and digital input and relay output to avoid undetected problems, providing the perfect foundation for building an industrial Ethernet infrastructure.